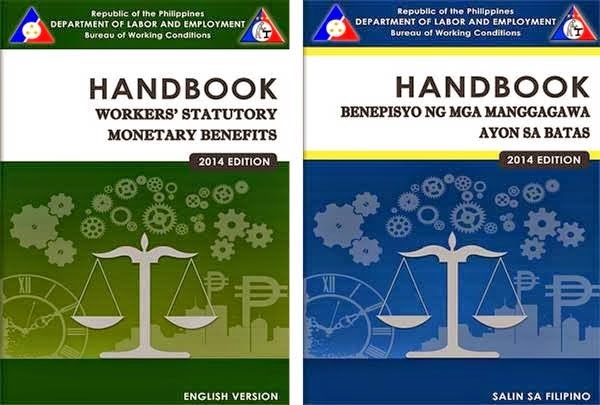 The Handbook on Workers' Statutory Monetary Benefits provides a comprehenive outline of the mandatory benefits that workers are entitled to receive under the Labor Code and other existing laws. Theodoro Santos advertised in the newspapers the sale of his Ford Fairlane 500. After the advertisement, a certain de Dios, claiming to be the nephew of Vicente Marella, went to the residence of Santos and expressed his uncle’s intent to purchase the car. Since Santos wasn't around, it was Irineo (son of Theodoro) who talked with de Dios. On being informed, Santos advised his son to see Marella, which the son did. Marella expressed his intention to purchase the car. A deed of sale was prepared and Irineo was instructed by his father not to part with the deed and the car without receiving the purchase price from Marella. Upon arriving at the house of Vicente Marella, he said that his money was short and that he had to borrow from his sister. Marella then instructed de Dios and Irineo to go the supposed house of the sister to obtain the money with an unidentified person. He also asked Irineo to leave the deed to have his lawyer see it. Relying on the good faith of Marella, Irineo did as requested. Upon arriving at the house of Marella’s supposed to be sister, de Dios and the unidentified person then disappeared together with the car. Santos reported the incident to the authorities. Thereafter, Marella was able to sell the land to Aznar. While in possession of the car, police authorities confiscated the same from him. Aznar filed an action for replevin (to recover the car). Claiming ownership of the vehicle, he prayed for its delivery to him. In the course of the litigation, however, Teodoro Santos moved and was allowed to intervene by the lower court. Lower court ruled in favor of Teodoro Santos saying that he has been unlawfully deprived of his car and he retains ownership of the same. May 24, 1997: spouses Jose and Lina Belmes executed a deed of sale in favor of respondent-spouses Dennis and Heide Alindogan over a house and lot located in Legazpi city. July 4, 1997: Lina Belmes wrote spouses Alindogan wherein she delivered the constructive possession of the house and lot to them. However, on July 5, 1997, before they could take actual possession of the property, spouses Gil and Brenda Torrecampo, petitioners, and spouses Jonathan Lozares and Jocelyn Torrecampo, entered and occupied the premises. Despite spouses Alindogan’s repeated demands, spouses Torrecampo failed and refused to vacate the property. The spouses Alindogan filed a Complaint for Recovery of Ownership, Possession and Damages against spouses Torrecampo. o On March 25, 1997, Belmes received from them P73,000.00 as advance payment for the sale of the house and lot. o On April 8, 1997, they executed a "Contract to Buy and Sell." o That to complete the agreed partial payment of P220,000.00, spouses Torrecampo paid spouses Belmes P130,000.00, but the latter refused to accept the amount. Thus, on July 7, 1997, spouses Torrecampo filed with RTC a Complaint for Specific Performance against spouses Belmes. The RTC ruled in favor of spouses Alindogan. It ruled that the contract between Belmes and Torrecampo was a mere contract to sell and thus, the ownership of the property was not transferred to spouses Torrecampo. CA affirmed in toto RTC’s ruling. Spouses Torrecampo contended that when spouses Alindogan bought the property, they already knew that the same property was previously sold to them and being buyers in bad faith, ownership of the property must pertain to spouses Torrecampo who, in good faith, were first in possession. A sale of 80 drums of caustic soda was agreed between Behn, Meyer & Co. and Teodoro Yanco. The merchandise was shipped from New York to Manila. However, the ship carrying the cargo was detained at Penang and the 71 of the 80 drums were removed. Respondent Yangco also refused to accept the 9 remaining and also refused to accept the offer of Behn Meyer to have the products substituted with other merchandise, which however were different from what was ordered. It must be noted that the contract provided for "c.i.f. Manila, pagadero against delivery of documents." Yanco filed an action seeking for damages for alleged breach of contract. A parcel of lot owned by Domingo Melad was being claimed by petitioner Felix Danguilan and respondent Apolonia Melad. Apolonia contended that she just moved out of the farm only in 1946 when Felix Danguilan approached her and asked permission to cultivate the land and to stay therein. Dangguilan, on the other hand, presented for his part 2 documents executed in September 14, 1941 and December 18, 1943, to prove his claim that the properties were given to him by Dominggo Melad through an onerous donation. The onerous part of the donation includes the taking care of the farm and the arrangement of the burial of Dominggo. RTC ruled in favor of Danguilan. CA reversed RTC’s ruling. It ruled that there was a donation, which was void for failing to comply with the formalities. The said lot was subject to mortgage in favor of the Republic Savings Bank for the sum of P1,500.00. Carbonell and respondent Emma Infante offered to buy the said lot from Poncio. Poncio offered to sell his lot to Carbonell excluding the house on which he and his family stayed. Carbonell accepted the offer and proposed the price of P9.50/sq. m..
Poncio accepted the price on the condition that from the purchase price would come the money to be paid to the bank. January 27, 1995: The parties executed a document in the Batanes dialect which is translated as: CONTRACT FOR ONE HALF LOT WHICH I (Poncio) BOUGHT FROM. However, when she went to Poncio, the latter informed her that he could no longer proceed with the sale as the lot was already sold to Emma Infante and that he could not withdraw with the sale. Poncio admitted that on January 30, 1995, Mrs. Infante improved her offer and he agreed to sell the land and its improvements to her for P3,535.00. February 2, 1995: A deed of sale was executed between Poncio and Infante. February 8, 1995: Knowing that the sale to Infante has not been registered, Carbonell filed an adverse claim. February 12, 1995: The deed of sale was registered but it has an annotation of the adverse claim of Carbonell. Thereafter, Emma Infante took possession of the lot, built a house and introduced some improvements. RTC ruled that the sale to spouses Infante was null and void. After re-trial, it reversed its ruling. CA ruled in favor of Carbonell but after a MfR, it reversed its ruling and ruled in favor of the Infantes. Spouses Villamor are the parents of respondents Mancer, Carlos and Domingo Jr. (respondents) and the grandparents of respondent John Villamor. In January 1982: Spouses Villamor mortgaged their 4.5-hectare coconut land in Masbate to the San Jacinto Bank as security for a P10,000.00 loan. 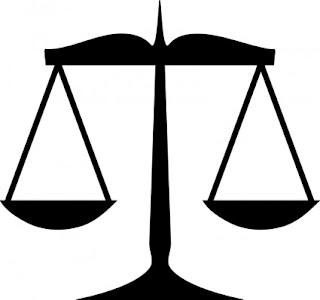 For failure to pay the loan, the property was extra-judicially foreclosed by the bank. Spouses Villamor failed to redeem the property so San Jacinto Bank obtained a final deed of sale in its favor in 1991. The San Jacinto Bank then offered the land for sale to any interested buyer. The children of spouses Villamor agreed to buy the property. The San Jacinto Bank agreed with the respondents and Catalina (one of the sisters of the respondents) to a P65,000.00 sale, payable in installments. Trinidad Tagatac bought a car for $4,500 in the US. After 7 months, she brought the car to the Philippines. Warner Feist, who pretended to be a wealthy man, offered to buy Trinidad’s car for P15,000, and Tagatac was amenable to the idea. Hnece, a deed of sale was exceuted. Feist paid by means of a postdated check, and the car was delivered to Feist. However, PNB refused to honor the checks and told her that Feist had no account in said bank. Tagatac notified the law enforcement agencies of the estafa committed by Feist, but the latter was not apprehended and the car disappeared. Meanwhile, Feist managed succeeded in having the car’s registration certificate (RC) transferred in his name. He sold the car to Sanchez, who was able to transfer the registration certificate to his name. Sanchez then offered to sell the car to defendant Liberato Jimenez, who bought the car for P10,000 after investigating in the Motor Vehicles Office. Tagatac discovered that the car was in California Car Exchange’s (place where Jimenez displayed the car for sale), so she demanded from the manager for the delivery of the car, but the latter refused. Tagatac filed a suit for the recovery of the car’s possession, and the sheriff, pursuant to a warrant of seizure that Tagatac obtained, seized and impounded the car, but it was delivered back to Jimenez upon his filing of a counter-bond. The lower court held that Jimenez had the right of ownership and possession over the car. Sharing to you the list of the first batch of materials under PALS BAR OPS PILIPINAS 2014. Bar Ops Pilipinas is a project of the Philippine Association of Law Schools (PALS) under the leadership of Dean Nilo Divina of UST. The materials below contain snap shot summaries of the decisions laid down by the Supreme Court in their decided cases as of March 31, 2014, as well as the cased penned by SC Justice Diosdado Peralta. These materials are made by the top volunteer students from different law schools all over the Philippines. All their outputs have been reviewed by incumbent law deans considered experts in the different bar subjects who unselfishly and heroically devoted their precious time for this endeavor despite their very tight schedule. Click the link/s below to download the materials. National Development Company (NDC) had in its disposal a 10 hectare property, commonly called as NDC Compound, located along Pureza St., Sta. Mesa, Manila. September 7, 1977: NDC entered into a Contract of Lease with Golden Horizon Realty Corporation (GHRC) over a portion of the NDC Compound for a period of ten years, renewable for another ten years with mutual consent of the parties. Sometime after September 1988, GHRC discovered that NDC had decided to secretly dispose the property to a third party. In the meantime, then President Corazon C. Aquino issued Memorandum Order No. 214 dated January 6, 1989, ordering the transfer of the whole NDC Compound to the National Government, which in turn would convey the said property in favor of PUP at acquisition cost. The order of conveyance of the 10.31-hectare property would automatically result in the cancellation of NDC’s total obligation in favor of the National Government in the amount of P57,193,201.64. PUP demanded that GHRC vacate the premises, insisting that the latter’s lease contract had already expired. Its demand letter unheeded by GHRC, PUP filed an ejectment case. GHRC argued that Memorandum Order No. 214 is a nullity. RTC rendered its decision upholding the right of first refusal granted to GHRC under its lease contract with NDC and ordering PUP to reconvey the said portion of the property in favor of GHRC. CA affirmed the RTC ruling. 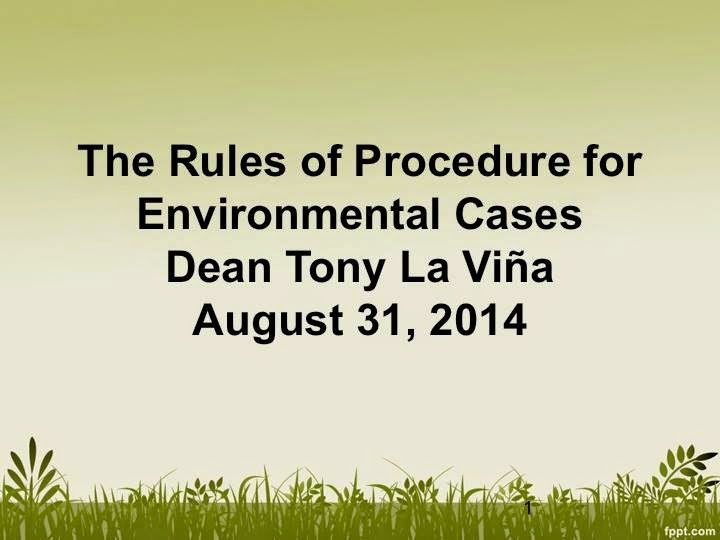 On August 31, 2014, Dean Antonio La Viña of De La Salle University College of Law posted on his Facebook account his powerpoint presentation entitled The Rules of Procedure for Environmental Cases. He wrote "For 2014 bar examinees: Since it has been mentioned that the Rule on Environmental Procedure, and specially the Writ of Kalikasan, is likely to be a topic for the Remedial Law Bar exams next month, I am posting for the benefit of my former students and for all examinees a short version of my regular lecture on the Rule, with emphasis on the two Writs - Kaikasan and Conitnuing Mandamus - but also the basics of SLAPP and the precautionary principle." PR Catalina L. Santos is the owner of 8 parcels of land located at Parañaque, Metro Manila. November 28, 1977: a certain Frederick Chua leased the subject property from defendant Catalina L. Santos, the said lease was registered in the Register of Deeds. February 12, 1979: Frederick Chua assigned all his rights and interest and participation in the leased property to Lee Ching Bing, by virtue of a deed of assignment and with the conformity of defendant Santos, the said assignment was also registered. "9. That in case the properties subject of the lease agreement are sold or encumbered, Lessors shall impose as a condition that the buyer or mortgagee thereof shall recognize and be bound by all the terms and conditions of this lease agreement and shall respect this Contract of Lease as if they are the LESSORS thereof and in case of sale, LESSEE shall have the first option or priority to buy the properties subject of the lease;"
September 21, 1988: Catalina Santos sold the eight parcels of land subject of the lease to defendant David Raymundo for a consideration of P5,000,000. Upon learning of this fact, the representative of Paranaque King wrote a letter to defendant Santos, requesting her to rectify the error and consequently realizing the error, she had it reconveyed to her for the same consideration of P5M. Only 2 days after Catalina Santos sold her properties did she reply to Paranaque Kings’ letter saying period has lapsed. July 6, 1989: counsel for defendant Santos informed the petitioners Paranaque Kings that the new owner is RAYMUNDO. Petitioner Paranaque demanded from the defendants to rectify their unlawful acts that they committed, but defendants refused and failed to comply with plaintiffs just and valid demands. RTC issued the order dismissing the complaint for lack of a valid cause of action. CA affirmed in toto. Spouses Villanueva are the registered owners of a property located at Leon Guinto St., Malate, Manila. 3. LESSEE (Bible Baptist) shall pay the LESSOR (Spouses Villanueva) within 5 days of each calendar month, beginning 12 months from the date of this agreement, a monthly rental of P10,000, plus 10% escalation clause per year starting on June 7, 1988. 4. That upon signing of the LEASE AGREEMENT, the LESSEE shall pay the sum of P84,000.00. Said sum is to be paid directly to the Rural Bank, Valenzuela, Bulacan for the purpose of redemption of said property which is mortgaged by the LESSOR. 8. That the LESSEE (Bible Baptist) has the option to buy the leased premises during the 15 years of the lease. If the LESSEE decides to purchase the premises the terms will be: A) A selling P1.8 million. B) A down payment agreed upon by both parties. C) The balance of the selling price may be paid at the rate of P120,000.00 per year. Petitioner Baptist Church seeks to buy the leased premises from the spouses Villanueva, under the option given to them. Baptist Church argues that the consideration supporting the option was their agreement to pay off the Villanueva's P84,000 loan with the bank, thereby freeing the subject property from the mortgage encumbrance. Baptist Church states that "it is true that it did not pay a separate and specific sum of money to cover the option alone. But the P84,000 it paid the Villanuevas in advance should be deemed consideration for the one contract they entered into – the lease with option to buy." Spouses Villanueva argued that the amount of P84,000 was paid for the rental payments and there is no separate consideration to speak of which could support the option. RTC and CA ruled in favor of Villanueva.